Today, I am starting a five-part series on online genealogical resources for Central New York. Many people passed through this locale on their way from New England to the Midwest. The famous Erie Canal, a means to migration, runs right through Central New York. Sometimes people resided for a few years in New York and then moved on. Some made it their home. We all look at census records, church records, immigration documents and vital documents, but after a while we can hit a brick wall. It seems as if there is nowhere else to look. We often forget about university and college collections. It isn’t always feasible to go to the institution and do research on site. Therefore, I am presenting you with what I have found online for the stay-at-home genealogist. I started with a simple Google search “colleges and universities in Central New York,” but you can substitute your location of interest. Please note that college and university libraries often carry information about places and people around the country, not just where they are located. 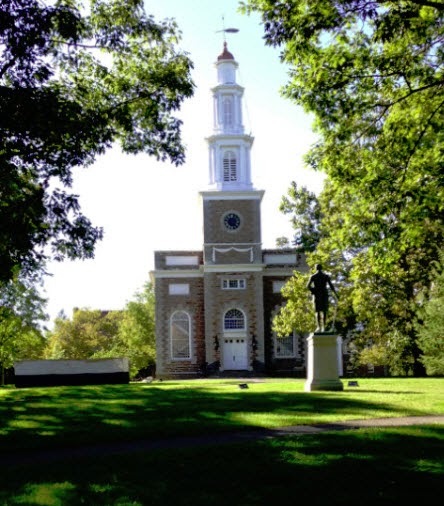 This week I will be discussing Hamilton College, a beautiful college located in Clinton, Oneida County, New York. For those of you old enough to remember the movie “The Sterile Cuckoo,” scenes from that movie were shot on the Hamilton campus. Communal Societies Collections. Here you will find links to several communal societies including the Shakers, the Israelite House of David, the Ruskin Commongood Society, the Snowhill Cloister and more. Unfortunately, I have not found any ancestors who lived in communal societies. Samuel Kirkland Collection. This collection contains letters and legal documents regarding Samuel Kirkland, the founder of the Hamilton-Oneida Academy, which later became Hamilton College. There are drop-down menus with names of correspondents, names of organizations, surnames and place names. You can also do a full-text search. In this collection I found an Indenture between Ezra Dewey and Shubel Griffin. (3) My Dewey line migrated to Central New York from New England. I now want to research Ezra Dewey to see if he is connected to my line. The old handwriting on the Indenture will also be a wonderful transcription exercise. Record of marriages, Clinton, New York, 1801-1848 This 48-page book created by Asahel Strong Norton contains handwritten entries of marriages. The handwriting is surprisingly easy to decipher. Again, I recognized many names—Tuttle, Stillman, Wheeler, Niles, Bushnell and Stanton. (5) Some of the pages contain detailed information about the wedding couple’s occupations and ages. Sometimes witness names are listed. I was amazed that the brides’ occupations were mentioned. Many women had jobs outside the home. This is valuable information that you may never find elsewhere. Hamilton College Archives - Alumni Review Index. If you have an ancestor who attended Hamilton College, you can search for their name in this database. I searched for Scripture and found two of my ancestors—Arthur M. Scripture and Parker F. Scripture. (9) You can also search for and order articles that have appeared in the Alumni Review. If you find information on Hamilton's website that is potentially useful, you may want to contact Hamilton at http://www.hamilton.edu/library/askalibrarian. Thank you, Hamilton College, for having so much valuable information available online! Dover Publications, Inc., Mineola, New York, Electronic Clip Art, Victorian Goods and Merchandise, 2006. (1) Enlistment Form of Ira E. Miller, Civil War Collection, 117th New York Volunteer Infantry Regiment, Enlistment Forms of the 117th New York State Infantry Regiment, Hamilton College Library Digital Collections, Hamilton College, Burke Library, Clinton, New York. (http://elib.hamilton.edu/117th-forms: accessed 1 Jun 2014). (3) Indenture between Ezra Dewey and Shubel Griffin, 8 Apr 1803, Samuel Kirkland Collection, Hamilton College Library Digital Collections, Hamilton College, Burke Library, Clinton, New York (http://elib.hamilton.edu/kirkland : accessed 1 Jun 2014). (4) Records of burials, Clinton, New York, 1802-1839 by Asahel Strong Norton, Hamilton College Library Digital Collections, Hamilton College, Burke Library, Clinton, New York (http://contentdm6.hamilton.edu/cdm/ref/collection/spe-man/id/71 : accessed 1 Jun 2014). (6) Suzy Clemens Collection of Letters, Hamilton College Library Digital Collections, Hamilton College, Burke Library, Clinton, New York (http://elib.hamilton.edu/clemens : accessed 6 Jun 2014). (7) Lucinda Dean Collection, a subcollection of letters from the Dean-Judson Family Papers held by the College Archives, Hamilton College Library Digital Collections, Hamilton College, Burke Library, Clinton, New York (http://elib.hamilton.edu/dean : accessed 6 Jun 2014). (8) Finding Aids, Hamilton College Library Digital Collections, Hamilton College, Burke Library, Clinton, New York (http://elib.hamilton.edu/rbr-finding-aids : accessed 1 Jun 2014). (9) Hamilton College Archives – Alumni Review Index, Copyright 2004, The Trustees of Hamilton College, Hamilton College Library, Special Collections & Archives, Hamilton College, Burke Library, Clinton, New York (http://www.hamilton.edu/library/collections/collegearchives/alumnireviewindex : accessed 1 Jun 2014).